Your doctor will probably remove the clouded lens using phacoemulsification, a modern form of extracapsular cataract surgery, so called because it leaves much of the lens capsule in place to support the new lens and help with healing. Phacoemulsification is a process that uses ultrasound to soften and break apart the clouded lens. The term "phacoemulsification" comes from the Greek phakos (referring to the shape of the lens) and the Latin emulsus (literally, "milked out"). Emulsification is the process of breaking up a substance into fragments that can be suspended in liquid. In traditional phacoemulsification, the surgeon first injects a local anesthetic behind the eye. For surgery on cataracts in children, in adults who are extremely anxious, and in patients with traumatic eye injury, general anesthesia may be used. Once the area is numb, the surgeon makes a small incision, removes some of the anterior (front) lens capsule, and inserts a handheld ultrasonic probe. The probe's high-speed vibration breaks up (emulsifies) the hard nucleus, and an attachment on the probe suctions out the fragments. The lens cortex can be removed by suction alone. A folded or compressed replacement lens is inserted through the tiny incision. Once inside the eye, the lens unfolds. Then the small incision is closed with only one or two stitches. Traditional phacoemulsification takes about half an hour, with two to three weeks required for recovery. It is painless. The local anesthetic can be administered with eye drops; no needles are used. The incision, made with a gem-quality diamond instrument, is only an eighth of an inch long and is so narrow that it is self-sealing, eliminating the need for sutures. Because the incision is placed at the edge of the crystal- clear cornea, there is no bleeding. Eye redness disappears within a day. Patients have good vision within a day or two. Preexisting astigmatism can be improved and postoperative astigmatism prevented when clear-corneal phacoemulsification is combined with astigmatism management. Since astigmatism is caused by irregularities in the shape of the cornea, sometimes the replacement lens itself will correct the astigmatism. 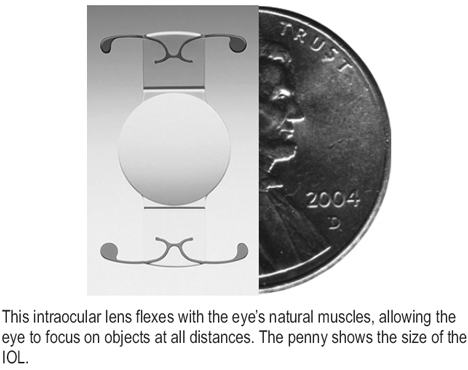 Toric lenses are used for this purpose. Otherwise, for astigmatism management, the surgeon might make small incisions in the limbus- the thin connection between the cornea and the white of the eye (the sclera). These are called limbal-relaxing incisions (LRIs), and they cause the cornea to become more rounded when it heals. Another astigmatism-management technique is to make small incisions of carefully calculated placement and size closer to the center of the cornea. Your surgeon might use a combination of techniques to produce a more-rounded cornea for the best possible surgical results. Technically, phacoemulsification is a form of extracapsular surgery, since the posterior capsule is left in place. In general, however, the term extracapsular cataract extraction surgery refers to the method in use before phacoemulsification was developed in the late 1980s. The older method may be preferred by doctors who have been using it for a long time. In rare cases, it is the only solution for patients with multiple eye conditions or with very advanced cataracts that can't be broken up by ultrasound. After injecting the anesthetic behind the eyeball, the surgeon makes an incision three-eighths of an inch to a half inch long, removes the entire nucleus, and aspirates (suctions out) the cortex. Ten sutures or so are needed to close the incision, which is large enough to accommodate either a foldable replacement lens or a rigid nonfoldable lens. Full healing takes about eight weeks. As mentioned, the larger incision changes the shape of the cornea and causes or worsens astigmatism. Strong glasses will be needed even after the procedure. Intracapsular cataract surgery involves removal of the entire lens, including the capsule. Intracapsular surgery was all but abandoned in the 1980s: It carries more risk and is more painful than extracapsular techniques, and recovery takes much longer. Since there is no remaining capsule to stabilize a replacement lens, patients need to wear thick glasses after this type of surgery. Refractive lens exchange, simply put, is cataract surgery for someone without visually significant cataracts. Refractive lens exchange can also correct extreme glasses prescriptions that fall outside the range of other surgical techniques such as LASIK. Many people with presbyopia, usually in their fifties, choose to have lens-replacement surgery before cataracts have a chance to develop. These people don't want to wear eyeglasses or contacts, and they choose not to have other forms of refractive-error correction, such as LASIK, since within a few years they might well need cataract surgery. With refractive lens exchange, they are basically killing two birds with one stone-eliminating the need for glasses now and the need for cataract surgery later.